The Momentum Khaki Chaise Lounge Collection features a rich, traditional styling that brings a touch of Classic elegance to any living room area. This beautiful set, legendary reputation for quality and comfort. 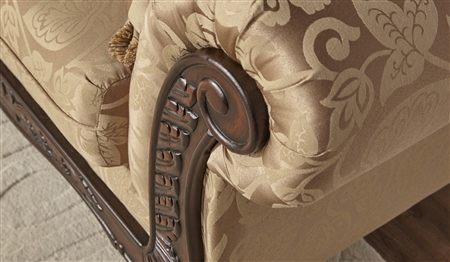 The Chaise Lounge feature an all-hardwood frame and ornately carved wood trim. A subdued paisley pattern embossed in a rich, Momentum Khaki fabric over high-density, Dacron wrapped foam seat cushions offer the utmost in comfort and styling. Back pillows in Safari Khaki complete the ensemble to give you many years of added comfort and durability. Whether you're enjoying quality family time or entertaining guests, with the elegant royal style and earth-tone colors will extend an open invitation for everyone to relax between its plush, rolled arms and settle back onto its soft, Cocoa Fringe Contrasting throwback Pillows. It features, one attach large loose pillow backs and one very flattering pillows. This suite embodies luxury for a fraction of the cost.